Get ready to sweat! 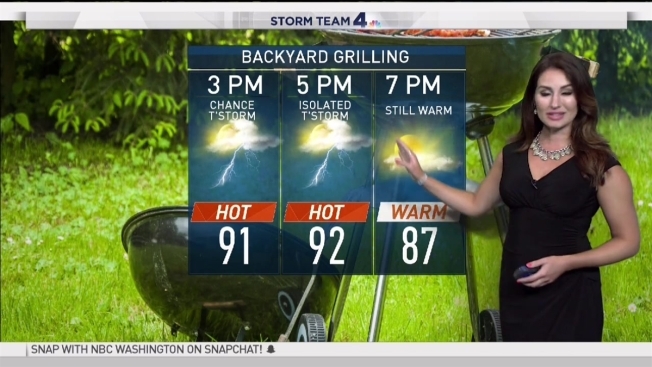 Heat and humidity will keep the D.C. area feeling near 100 degrees for much of this week. Afternoon highs Tuesday will be in the low 90s for D.C. Areas north and west will see slightly cooler temperatures. Evening storms are possible Tuesday, but it'll do little to cool temperatures down. Storms will be isolated but are likely to make it to the D.C. metro area. More intense heat is coming in the later half of the week. Afternoon highs will likely be in the mid-90s, with heat indexes that could reach almost 100 degrees later this week. And the weekend isn't looking any cooler. Storm Team4 says the weekend looks blazing hot, with highs closing in on 100 degrees. Rain will be more likely Sunday than Saturday. Monday may bring some relief, with temperatures falling closer average.